The future of leisure in Dungannon is coming under the spotlight. The public are being asked to have their say the existing leisure centre, which dates from the 1970s, the classes and courses currently on offer, as well as opinions on what any potential new leisure development should include. It’s all part of a consultation process opened by Mid Ulster Council. Results of the research will feed into an options appraisal, which will explore redevelopment on the Circular Road site, a new build on the existing site or a new facility in another location. 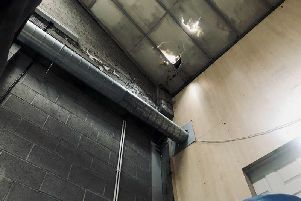 In the interim the Council will be undertaking remedial structural work early next year at the existing centre to ensure the building can continue to offer a broad range of leisure opportunities. “Dungannon Leisure Centre has served local people well for more than 40 years. “The time has come, however, to consider how we can best continue to meet the needs of customers in the future and this is the first step in the process. “What people tell us now about the leisure centre and about their leisure priorities moving forward will inform the development of options and the ultimate decision we may take about a potential new centre”. A public consultation meeting will be held on Wednesday, 8 November, at 7pm in Dungannon Leisure Centre and the online survey can be completed on the Council’s web site at www.midulstercouncil.org/dungannonlcsurvey.